Luigi Pellarini was a prolific designer of utilitarian aircraft who emigrated from Italy to Australia. He worked on many aircraft designs, some of which remained as drawings, became one-off prototypes or saw limited or mass production. Designed in Australia in the late fifties by Luigi Pellerini. A sesqui-plane design for use by the military, there was little interest however and the project did not go any further. The Transavia Airtruk did evolve from this design and was a successful agricultural aircraft." The design appears to be a canard sesqui-plane pusher with split V-tail! It may be disputed that the PL.12 Airtruk evolved from this design, since the PL.12 is more closely related to the PL.11 Airtruck. But no doubt the Air Jeep is a close cousin of the Airtruk. In its early stages of its development, the GAF Nomad was referred to as Project N. It began as a single-engined utility and agricultural aircraft. 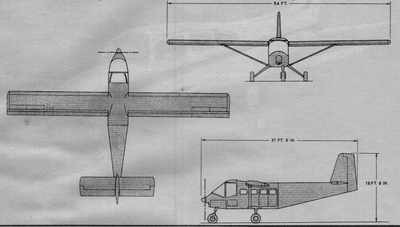 This 3-view sketch shows the original single-engined configuration.